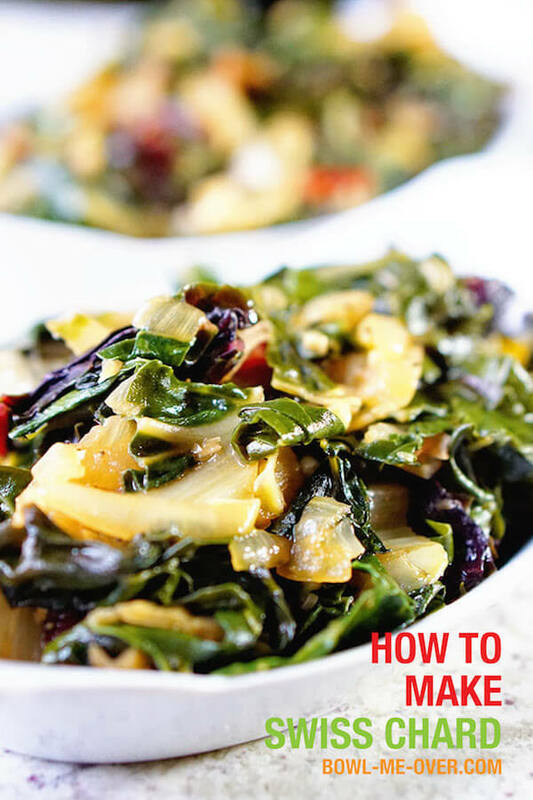 How to Make Swiss Chard – Braising greens and garlic together makes for a tantalizing, savory vegetable. 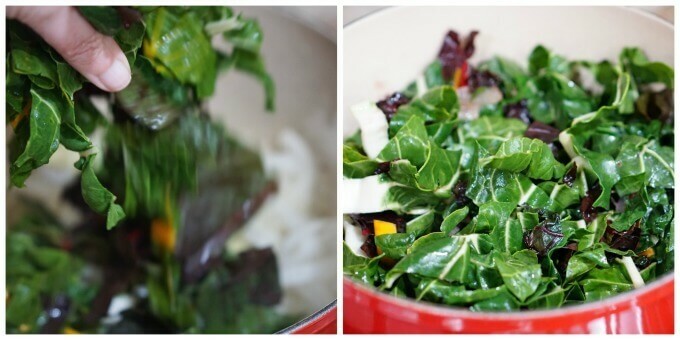 If you flip out over dark, leafy greens this simple side-dish is for you! This post has been updated from February 2017 to improve reader experience. Easy step-by-step directions to make Swiss Chard. A couple weeks ago I stopped by the market and found the most amazing Swiss Chard. It was so gorgeous I knew I had to make a fabulous soup with it so I did. I cleaned the chard, chopped it up and into the soup it went. I slow cooked it all day and was so excited, I had to sneak a bite. I stirred it up well, grabbed a spoonful and into my mouth it went. The flavor was amazing, but as I chewed it, I tasted grit. No, it can’t be! I grabbed another spoonful. Nope, still tasted grit. I’m sharing this in the hopes you’ll avoid my mistakes, back to the market I went to purchase more chard. This time I got yellow, red and green chard. And by-golly I cleaned it really good! I wasn’t going to make that mistake twice! Swiss Chard – a rainbow of colors! Rinse the greens in a large bowl submerged in water. Give it a good jshhh, swished it around several times, rinse well. Chop the chard into small bite sized pieces. Just remove the end of the stem, no need discard the whole stem – it is edible. Fill the bowl with water again, swish around and dump the water. Complete this process until you are satisfied all of the grit is removed from the chard. It will take 4-5 times until the water runs clear. Note – I’ve purchased chard at the market. Perhaps the Swiss chard from the grocery store is cleaned better. Just know it will take several rinses before the grit is removed. Add the chard to a large heavy bottomed pot. Do you cook the stems of Swiss chard? Absolutely! The stems of the Swiss Chard are edible and delicious! Is Swiss chard good for you? Yes! This vegetable is high in potassium with over 400 mg per 1/2 cup serving! 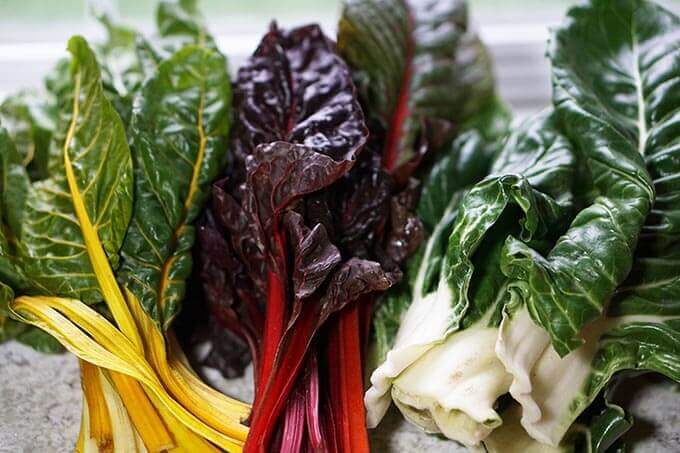 Chard is rich in vitamins K, A and C and packed with potassium and iron. This vegetable is a great healthy choice! 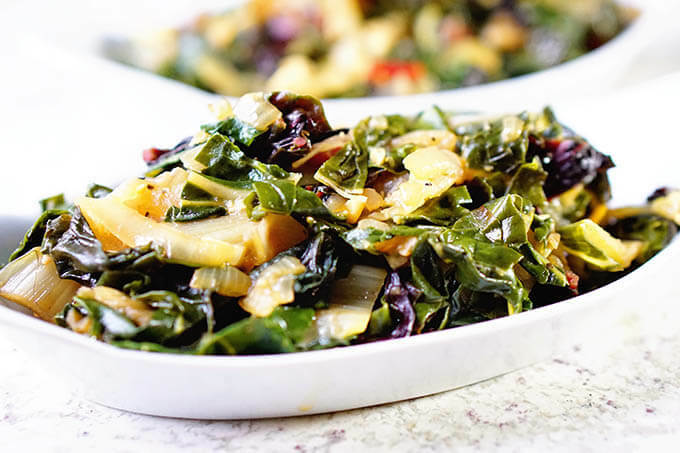 Braised Chard is delicious to serve as a vegetable, in soups or even vegetables. This recipe braises the chard. Braising it turns an almost bitter leaf into savory goodness. The combination of greens and garlic is tantalizing. Braising the greens and garlic together and it becomes garlicky sweet goodness! It’s easy too and only takes 30 minutes. In a large heavy bottom pot, over medium heat add the olive & butter to the pan. When melty and hot, add the onions. While the onions are cooking prepare the chard. Slice off just the ends of the stalks of chard and discard. Slice and dice the rest of the stalk and the leaves. Add to the pot with the onions and add all of the seasonings. Give it a good stir. Next mince the garlic. Add it to the pot with everything else. Give a good stir. Reduce heat to medium low, cover tightly and simmer for twenty minutes, stirring everything 7 to 8 minutes. I know you’re going to love this veg! 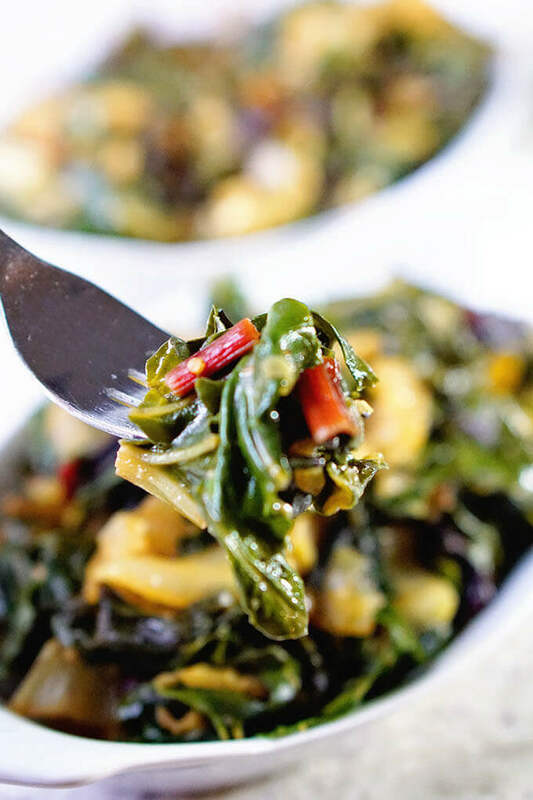 Once you know how to make Swiss chard you’ll be enjoying this often! Leftovers on day two were transformed into a wrap with chicken and humus, the perfect lunch! Day three I served them alongside an omelet and we enjoyed breakfast for dinner! More yummy vegetable side dishes? I got you covered, side dishes are definitely my thing! This is a terrific side dish in the fall and winter when chard is in season. It’s really one of my favorites! Served alongside a great Roast Beef or Chicken, it’s the perfect pairing. I hope you really enjoy this recipe! When you make it please be sure to tag me on Instagram @bowl_me_over or #bowlmeover – I’d love to see your pictures! And if you get a chance, please comment and leave me a ⭐⭐⭐⭐⭐ rating below! How to Braise Chard - The combination of greens and garlic is tantalizing. Braising the greens and garlic together makes the vegetables so delicious and savory. While the onions are cooking prepare the chard. Slice off just the ends of the stalks of chard and discard. They can be really tough. Slice and dice the rest of the stalk and the leaves. Add to the pot with the onions and add all of the seasonings. Give it a good stir. Now mince the garlic. You'll need three tablespoons. When minced, into the pot it goes with everything else. Give a good stir, reduce heat to medium low, cover tightly and simmer for twenty minutes, stirring everything 7 to 8 minutes. Want to make this vegan? Simply omit the butter and add additional olive oil! If you enjoy this lovely side dish, then please check out my 3 Ingredient Steamed Green Beans Recipe – so light & lovely! This looks delicious and healthy! Thanks for sharing. Checking off all those bases, enjoy Luci! Beautiful pictures and recipe. I want to reach in and grab a fork full! I’ll pass the plate! 😀 Thanks Dan!! The colors are amazing! This looks delicious and healthy! I will be trying this one! Thank you Nikki, swing back and let me know what you think, we just love this dish! I love any and all kinds of braised greens – they’re just all so good! Love how much garlic you put in…and the pinch of red pepper flakes! Perfect bursts of flavors! Thanks Sarah, braised greens are the best, just so much lovely flavor! Yum, this would totally get me to eat more veggies! Especially less common ones like Swiss chard. And chard is at it’s peak right now, just so tasty! Thanks for stopping by Matt!! No wonder Ive never liked Swiss chard at home… Ive never braised it and it always tastes awful. 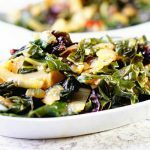 Im so excited to try this method as I LOVE Swiss chard at restaurants, but now I can make it at home successfully! I hope you try this again Michele braising it gives it so much flavor, just delicious! What a beautiful side dish and so nutritious! I suppose the key really is to rinse, rinse, rinse to avoid that grit. I’ll remember that! Thanks for the great tips. Yes, learn from my mistakes, LOL! Enjoy Sandra! What an excellent way to get my greens!! Love it! I love using Swiss Chard and the stems! Especially when I find rainbow! It is a great way to switch up the usual veggie side dish! Swiss chard is so healthy but I’ve been always nervous about making it because I wasn’t sure how! This recipe is so helpful and sounds so tasty, too! Thank you Liza! It’s one of my favorite veggies especially this time of the year!